The term “Lasagna Gardening” was coined by Patricia Lanza, who wrote a book on the subject in 1998. Lasagna gardening is a very descriptive term because the method entails using layers of organic material in a manner similar to the pasta, meat and sauce layers of its namesake. Lanza discovered this method out of necessity. She is not the first or only person to do so. If you read a lot of gardening books and articles from decades past you will see that this method of gardening has been “discovered” several times and has been known by several names. Lanza’s contribution for gardeners was to promote the method in an easily relatable way. I ran into Lasagna Gardening by accident, which is pretty common. People who “discover” methods like this usually do so because they have a busy schedule. Read My Bed Prep Story here. The first layer of a Lasagna Garden is a smothering layer – cardboard or newspaper. This layer will suffocate existing grass and weeds and create a dark, moist, protected layer where earthworms and other organisms will thrive and multiply. If you are building the bed over Bermuda grass, make sure to use a heavy suffocation layer. It is more difficult to smother. The next layers can be made up of any organic matter that could be composted. The best results will be obtained if attention is paid to alternating the layers with “browns” and “greens” as you would in a compost bin. The layers should be built fairly quickly, reach a height of at least 18”, then be allowed to rest and decompose for a season or so. Greens: Grass clippings, coffee grounds, manure, seaweed, vegetable & fruit waste, green garden waste. Browns: Fallen leaves, hay, pine straw, shredded paper, deciduous garden clippings, peat moss, wood mulch. My only exception to the lasagna garden formulas in Lanza’s plan is the use of peat moss as one or more of the layers. Peat moss is not a sustainable product. It may be used for special potting applications, but avoid using it in the garden. When the material has decomposed, it will have reduced to a thickness of approximately 6”. Seeds and transplants can be planted directly into the finished compost. If the cardboard layer is still present, you may have to cut a hole in it to plant larger transplants, but if the lasagna has been sufficiently moist during its resting period, this is seldom the case. A lasagna garden can be built any time of year, but late fall for spring planting, or early spring for fall planting is best. These times of the year have more rainfall and there is less need to provide supplemental water to keep the lasagna moist. Maintaining an established lasagna garden is easy. 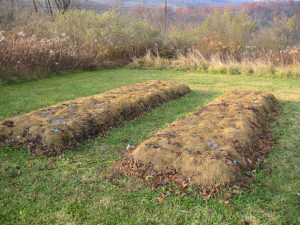 Simply continue to add organic material to the top of the bed as it is available in a form similar to mulching. It will continue to decompose and will maintain a deep, fluffy layer of compost in which to plant. Weeds are seldom an issue in a well-maintained lasagna garden. Continuous layers of materials suppress weeds efficiently. Dense planting within the lasagna will also aid in weed suppression. Lasagna Gardening is wonderful. It is a perfect Reduce, Reuse, Recycle practice. Lots of materials that would be destined for the landfill can be used. Some household waste can be reduced since kitchen waste, coffee grounds, dryer lint, and many household paper products can all be used in the layers. There are those who argue that lasagna gardening is not a green or sustainable practice. They base this opinion on the fact that it takes paper products out of the recycling circle and may result in the loss of more trees. It is true that it takes far less energy to recycle cardboard and newspaper than it does to generate new cardboard and newspaper. But it is also true that tons of paper waste are still reaching the landfill. It is also true that trees used for paper are a managed commercial crop. They are not cut from the wild. Paper mills plant, harvest, and replant, just as we do food and fiber crops. On a homeowner level, I believe it is an earth-friendly practice. It reduces tilling and deep cultivation; a practice that upsets nature’s balance in several ways. We support no-till gardening methods, and Lasagna Gardening is definitely no-till. You can read more about No-Till Gardening here. The Lasagna Gardening method works for many gardeners, and is a good method for the Gulf Coast. It is one of the gardening practices that allows us to manage our tricky soils. Over time, the native soil below the lasagna garden is also improved. Lasagna gardens generally have unstructured sides, but could be bordered if you choose. The border can be installed before building the lasagna, during decomposition, or when it has decomposed and is ready for planting. No one tells their story better than the original author. Read Patricia Lanza’s 1999 article from Mother Earth News here. Lanza has written a book on the method if you are interested in looking further.